Alma: There are some women who turn a possibly beautiful thing into something no better than the coupling of beasts – but love is what you bring to it. Some people bring just their bodies. But there are some people, there are some women, John who can bring their hearts to it, also – who can bring their souls to it! John: Souls again, huh – those gothic cathedrals you dream of. Your name is Alma and Alma is Spanish for soul. Some time I´d like to show you a chart of the human anatomy that I have in my office. It shows what your insides are like, and maybe you can show me where the beautiful soul is located on the chart. 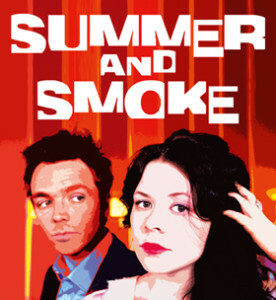 On 6 October 1948, Summer and Smoke premiered at the Music Box Theater, New York. In 1952, Geraldine Page played the lead role in a revival at the newly founded Circle in the Square Theatre in downtown New York. Her legendary performance is credited with the beginning of the Off-Broadway movement. 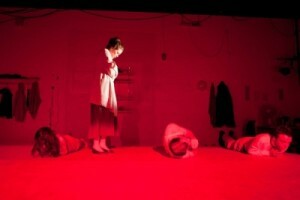 To celebrate the 100th anniversary of Tennessee Williams´ birthday English Theatre Berlin presents a production of his classic, Summer and Smoke, directed by Blake Robison, Artistic Director at Round House Theatre, Washington/DC. Thomas Lanier “Tennessee” Williams was born on March 26, 1911 in Columbus, Mississippi. The second of three children, his family life was full of tension. His parents, a shoe salesman and the daughter of a minister, often engaged in violent arguments that frightened his sister Rose. In 1927, Williams got his first taste of literary fame when he took third place in a national essay contest sponsored by The Smart Set magazine. In 1929, he was admitted to the University of Missouri where he saw a production of Henrik Ibsen´s Ghosts and decided to become a playwright. But his degree was interrupted when his father forced him to withdraw from college and work at the International Shoe Company. Eventually, Tom returned to school. In 1937, he had two of his plays produced by Mummers of St. Louis, and in 1938, he graduated from the University of Iowa. After failing to find work in Chicago, he moved to New Orleans and changed his name from “Tom” to “Tennessee” which was the state of his father’s birth. In 1939, the young playwright received a $1,000 Rockefeller Grant, and a year later, Battle of Angels was produced in Boston. After moving from St. Louis to New Orleans in 1939, he adopted “Tennessee Williams” as his professional name. In 1944, what many consider to be his best play, The Glass Menagerie, had a very successful run in Chicago and a year later burst its way onto Broadway. Williams followed up with several other Broadway hits including such plays as A Streetcar Named Desire, Summer and Smoke, A Rose Tattoo, and Camino Real. He received his first Pulitzer Prize in 1948 for A Streetcar Named Desire, and reached an even larger world-wide audience in 1950 and 1951 when The Glass Menagerie and A Streetcar Named Desire were made into motion pictures. Later plays which were also made into movies include Cat on a Hot Tin Roof (for which he earned a second Pulitzer Prize in 1955), Orpheus Descending, and Night of the Iguana. On February 24, 1983, Tennessee Williams choked to death on a bottle cap at his New York City residence at the Hotel Elysee. He is buried in St. Louis, Missouri. In addition to twenty-five full length plays, Williams wrote dozens of short plays and screenplays, two novels, a novella, sixty short stories, over one-hundred poems and an autobiography.